Here are 12 inspirational resort bathrooms that make you want to remodel your home or jump on a plane to go on vacation. Some of these bathrooms are simple while others are quite elaborate. Some work around the natural elements of the place, others emphasize modern decor and luxury facilities. 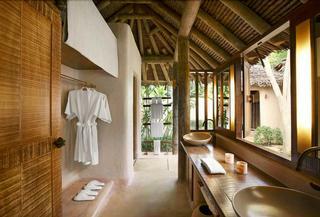 We love outdoor showers in the tropics, open-air design and huge tubs large enough for two. 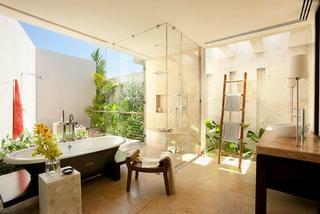 On this list you will find many inspirational designs for outdoor bathrooms. Next Read: 16 Coolest Hotel Bath Tub Views. 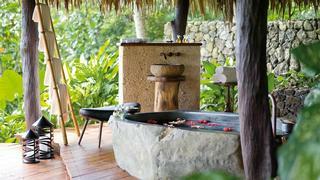 Blancaneaux Lodge in Belize has a huge outdoor bathroom just steps from a pool with a view of the jungle. 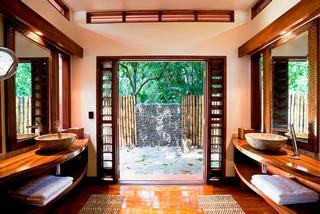 Take an open-air shower surrounded by the sounds of tropical song birds. A former Francis Ford Coppola family retreat, Blancaneaux Lodge is a luxury tropical hideaway in Belize. Offering just 20 guest accommodations, the lodge is a perfect getaway for those who value privacy and unspoilt nature. Get treatments with a view of the waterfall at the unique eco-friendly rainforest spa. Choose from wraps, massages, body polishes, and other healing therapies. The spa specializes Thai massage based on the ancient techniques at the Sacred Wat Pho Temple in Bangkok. The heated outdoor pool uses hydro-electricity to conserve energy. Spa treatments utilize only locally sourced organic ingredients. The property is a great base for exploring the surrounding nature. Take a guided jungle hike, go horseback riding, mountain biking or explore the stunning caves in the area. Bird watchers can observe hundreds of exotic birds. Guided birding tours are offered around the property's gardens and trails. The lodge offers educational workshops throughout the year, so be sure to check the schedule before you plan your visit. Guests are accommodated in individually decorated cabanas and luxury villas with spectacular scenery and handpicked interiors. Honeymooners should book the Honeymoon Cabanas with views of the waterfalls. The resort offers special packages for couples, so be sure to ask. If you need more space, book the 1,600 square foot Two-Bedroom Villa with an open-air living room with a kitchen and two bedrooms. "Enchanted Cottage" offers some of the best views of the surrounding creek and mountains in the distance. This luxury cottage has a private bath house with an open fire, shower, Japanese tub and steam room. Cottage rates at the lodge start at $268 per night. If you are looking for a beach getaway in Belize, check out Francis Ford Coppola's beachfront hotel, Turtle Inn. 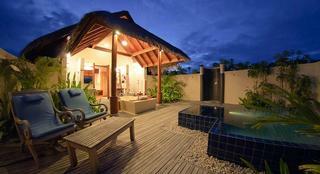 This open air bathroom at Niyama is a combination of natural and modern. Slick modern lines are used to create a unique tropical sanctuary. As the name implies, when you check into this thatched-roof villa at Anantara Dhigu you will be able to see stunning sunsets right from the villa. A private pool is elevated off the ground, a very unique pool design. Click here for 25 Most Amazing Private Pools. This beautiful designer bathroom at Rosewood Mayakoba has a spacious layout with its own private little garden and an outdoor rain shower. 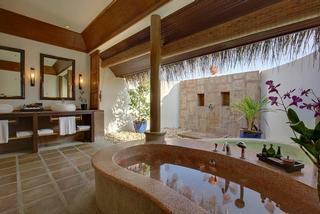 Enjoy the warming rays of the Mexican sun as you take a shower surrounded by plants. The tub is large enough for two. There is also an indoor shower. 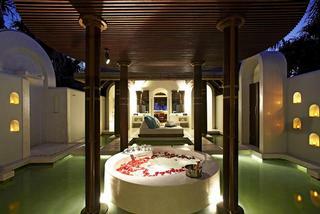 Immerse yourself in a warm water or fragrant oils and rose petals in this unique bathroom at Anantara Kihavah Villas. The designers of the beach bure bathrooms at Likuliku incorporated earth elements to create a smooth transition between indoor and outdoor space. This beautiful bathroom on Laucala Island makes you feel a part of the surrounding nature with earthly elements and open-air design. Enjoy a relaxing soak in a deep soaking tub surrounded by the sounds of tropical birds. 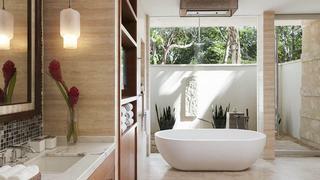 This guest bathroom at Dorado Beach is both natural and luxurious. The bathroom invites in nature through an open wall and a plush outdoor rain shower. Dorado Beach, A Ritz-Carlton Reserve in Puerto Rico is unlike any Ritz-Carlton you've ever stayed at. If you like the Ritz-Carlton brand, you will love this resort. Set on 1,400 acres of the former Laurance Rockefeller estate, the resort is ultra-luxurious. There are just 100 huge bedrooms and 14 suites right on a beautiful sandy beach. Once you open the floor-to-ceiling sliding doors, you will feel one with the ocean. Spa Botanico is unlike any other in the Americas and is taking spa treatments to a new level. The spa combines a holistic philosophy with modern techniques with inspiration from ancient local healers often referred to as Holy Hands (Manos Santos). Before and after a treatment, enjoy the facilities which include warm and cool pools, and waterfall showers. The spa treatment rooms are unique and built to bring you closer to nature. 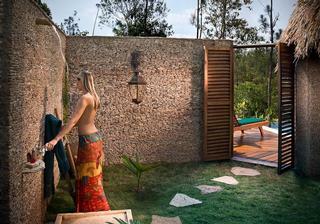 You can get a massage in an open air Treehouse, or book one of the glass-walled treatment pavilions. Jean-Michel Cousteau's Ambassadors of the Environment programs which is offered at other Ritz-Carlton properties, will also be available at Dorado Beach. You will be able to discover unique Puerto Rican fauna and flora both on land and sea, including coral reefs, birds, wetlands, and traditional Taino culture. Activities include snorkeling, kayaking, hiking and exploring an archaeological site directly on property. The eco-friendly Ambassador House was built using regional materials and renewable energy. Mi Casa by Jose Andres is the flagship dining venue at the resort, serving a menu locally-caught seafood and avant-garde dishes. The wine list is extensive with diverse vintages from around the world. In addition to Mi Casa, there are three other dining venues, including an oceanside bar Positivo Sand Bar, an open-air bistro Encanto Beach Club Bar & Grill and La Cocina Gourmet, serving Puerto Rican coffees, homemade ice crean and other local favorites. Rates start at USD $1,500 per night (doradobeach.com). 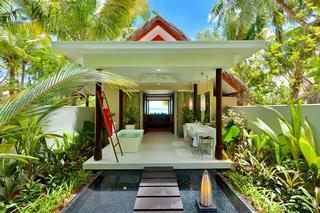 A beatiful pink free-form tub is the centerpiece of this indoor / outdoor bathroom at Kanuhura. 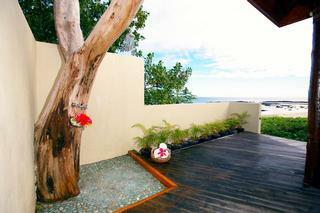 Indulge in a relaxing soak and take outdoor showers after playing on the beach. This beautiful natural bathroom on Naka Island is a calm sanctuary with its simple earth tones and a lot of attention to detail, such as an elevated ledge for slippers and a high ceiling. 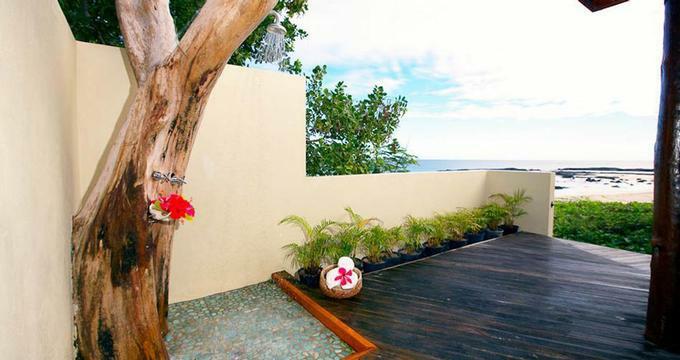 This simple outdoor shower at Yasawa features a shower head attached to a tree. 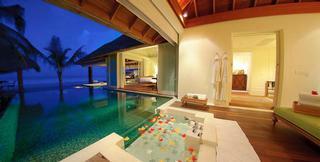 The views of the sandy beach from the outdoor shower are incredible. Enjoy incredible views of the ocean and the beach at Naladhu Maldives. The tub is separated from the pool with a clear edge that makes you fell like you are taking a bath in a huge pool.